By day, the cafeteria and kitchen of Christ the King Catholic Church is busy preparing lunch in the service of its adjoining K-8 school. Most nights, it's pretty quiet—sometimes the facilities are used to host fundraisers or other church-related events. But on a Monday in February, a small gathering coalesced for a different purpose: the intersection of healthy eating practices and African heritage. 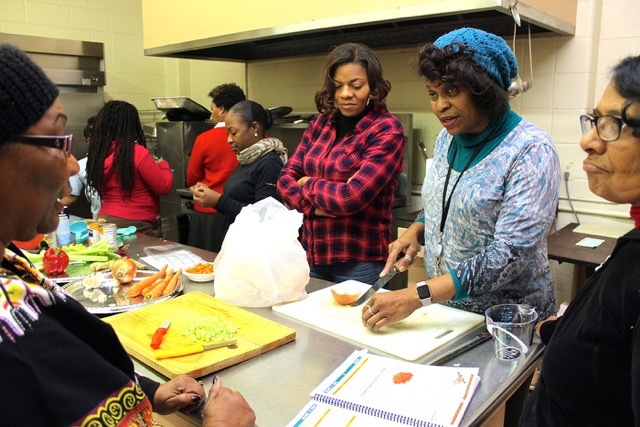 This is the mid-term installment of a six-class series on the "A Taste of African Heritage" diet—a nutritional education effort offered in a partnership between the Detroit Food Policy Council (DFPC) and the nonprofit Metropolitan Organization Strategy Enabling Strength (MOSES). 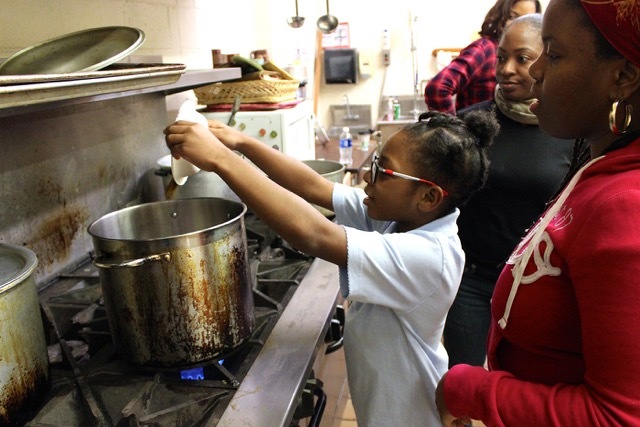 "A Taste of African Heritage" is just one of many approaches taken by the DFPC to address inequities in Detroit's food systems, and retool some of the ways Detroiters deal with their health and wellness through eating. Studies have shown that African-American populations suffer disproportionately from food-related health conditions, such as obesity, hypertension, and Type II diabetes. The reasons for these disparities are myriad. There's cultural and social factors, such as an affinity for traditional home cooking that may include lots of salt, animal fats, or sugar. Also the cheapest foods are almost always less healthy than fresh or organic options, and low-income families often have less access to healthier eating alternatives. Organizations like the DFPC and MOSES seek to address these inequities through policy reform, the creation and support of localized and sustainable food systems, and educational efforts, like the one taking place over six wintery Mondays in Christ the King's kitchen. While previous DFPC educational series were aimed directly at community members, this particular series has the ambition of training participants to disseminate the learnings through their own classes, often in the context of auxiliary congregational activities or health ministries. One such participant is Nefer Ra, who teaches urban farming classes at Earthworks—an urban farming campus connected with the long-running Capuchin Soup Kitchen on Detroit's east side. Nefer Ra is a powerful presence in the urban farm community, and a tireless advocate for food justice in Detroit. But despite the seriousness of her mission and the determination with which she tackles the obstacles that face Detroiters seeking food sovereignty, Nefer Ra's demeanor is playful. One participant suggests that being a good cook is a way to get a man. "Oh no, I don't want him to know I can cook," Nefer Ra says. "Then he'll expect it!" The kitchen explodes in laughter. "When you're raising kids, you have to remember you're helping form their tastes," says DFPC program director Kibibi Blount-Dorn. "It can take up to sixteen times for a child to adjust to a new taste, especially something bitter or with strong flavors, so you have to keep presenting it to them. It can even take as many as twenty-one times if your child is especially picky. "I have one of those 21-times children," she adds with a laugh. Tonight's lesson focuses on beans and rice, which is a full-protein, vegetarian, lactose-free means of adding calcium to a diet. The six sections of the class cover: spices, greens, whole grains, beans and rice, tubers and mashes, and fruits, veggies, and healthy lifestyle. The recipes and formulations in the Taste of Africa diet rely on replacing some of the dangerous staples of "soul food"—often high in sodium—with an array of traditional spices from the African diaspora, such as allspice, curry, and cilantro, that might feature flavors that children find strong. But the course doesn't propose radical or unsustainable lifestyle alterations, instead seeking to incorporate substitutions and gradual changes in habits. "I came to this work while I was changing my own diet," says Bynum. "It's a gradual process." "I gave up pop a couple years ago," another participant puts in. "The other day, at a church gathering, they had a pitcher of what I thought was water, and it turned out to be Sprite. I took a sip by accident and was horrified by how sweet it was. I lost the taste for it." Ben Washburn, MOSES treasurer and representative of Christ the King Catholic Church, helped facilitate the class. "We see education and experiences like this as a foundational way of building a strong congregation," Washburn says. "Just look at this place. Who wouldn't want to be a part of something like this?" It's true that collective food preparation and sharing meals falls increasingly by the wayside in the name of convenience, round-the-clock working hours, and fractured communities. So perhaps it's not only a culinary heritage that classes like this are hoping to reclaim, but one of togetherness, mutual support, and mealtimes as a positive and inter-generational experience.